We are your #1 place to find quality garments at competitive prices when you are buying corporate workwear online. A stylish yet functional corporate uniform is essential in your workplace. It can help ensure your staff not only look great, but that they promote a polished and professional image for your business. We can outfit your staff from top to toe. Complete the look by having your logo embroidered or printed onto the garments when you order your corporate uniforms online. We can supply the completed clothing direct to you...no stress, no fuss. Easy delivery Australia wide. Click on the images below to see a selection of our extensive range..
Corporate polo shirts are a staple of your corporate clothing wardrobe. For the more casual offices or just as a 'Casual Friday' option we are sure to have the perfect option for add to your business uniform. For the more corporate of business uniforms a tailored business shirt is an every day essential. An embroidered shirt with your company logo is not only a professional looking uniform but will ensure your staff look good and feel great. We also have an extensive range of women's corporate wear matching most men's styles. 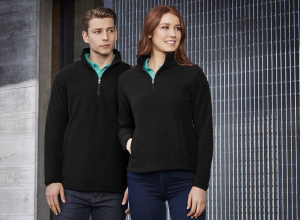 For the cooler months adding a jumper or vest to your staff uniforms will ensure everyone is looking their best. From polar fleece jumpers to polyester water proof vests you will definitely be warm. A knitted jumper, vest or cardigan will definitely look smart through winter as part of your staff uniforms. Embroider your logo on them as well to really give it the finishing touch. Our range include 100% Merino, Wool/Polyester blends and Acrylic blends. Corporate clothing has never looked this good. 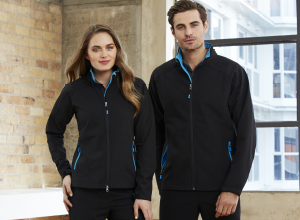 From stylish soft shell jackets to waterproof outdoor parkas...we have the perfect corporate jacket to include as part of your business uniform. Who wouldn't want to look good while they stay warm and dry? Logo jackets are also a great 'walking billboard' for your business at your next outdoor event. So you have your embroidered polos organised, a stylish business shirt embroidered with your logo and a jacket as part of your corporate clothing...but what about the bottom half? We have a great range of high quality pants, skirts, tailored shorts and corporate dressed all stocked, and an extensive range of sizes, ready to add to your staff uniform. Finish off your corporate clothing with a matching belt or corporate tie. Or speak to us about manufacturing a custom tie or scarf to complement your brand.